Mark Richards, my co-presenter in the Software Architecture Fundamentals video series, is a a deeply knowledgable architect who doesn’t blog much, so I’m presenting this idea on his behalf. 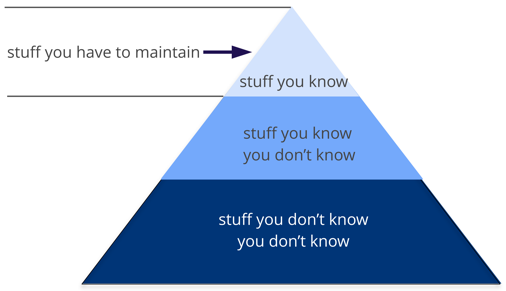 He first exposed me to the Knowledge Pyramid while we were preparing Software Architecture Fundamentals Part 1 and it resonated with me immediately. 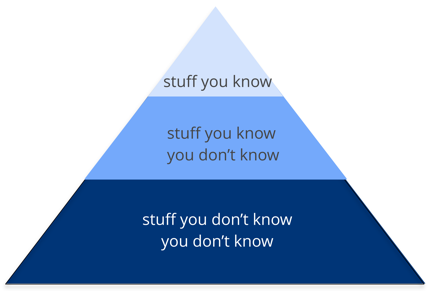 Any individual can partition that knowledge into three sections: Things You Know, Things You Know You Don’t Know, and Things You Don’t Know You Don’t Know. A deveoper’s early career focuses on expanding the top of the pyramid, to build experience and expertise. This is the ideal focus early because you need more perspective, working knowledge, and hands-on experience. Expanding the top incidentally expands the middle section; as you encounter more technologies and related artifacts, it adds to your stock of Things You Know You Don’t Know. Expanding the top of the pyramid is beneficial because expertise is valued. However, the Things You Know are also the Things You Must Maintain–nothing is static in the software world. If you become an expert in Ruby on Rails, that expertise won’t last if you ignore it for a year. 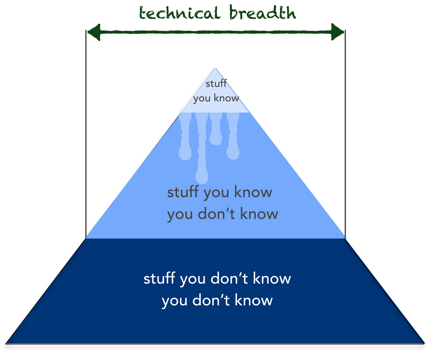 The things at the top of the pyramid require time investment to maintain expertise. 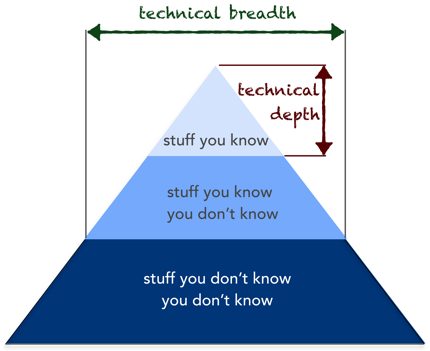 Ultimately, the size of the top of your pyramid is your technical depth. Mark’s pyramid illustrates how fundamentally different the role of architect compares to developer. Developers spend their whole career honing expertise, and transitioning to the architect role means a shift in that perspective, which many architects find difficult. This in turn leads to two common dysfunctions: first, an architect tries to maintain expertise in a wide variety of areas, succeeding in none of them and working themselves ragged in the process. Second, it manifests as stale expertise–the mistaken sensation that your outdated information is still cutting edge. I see this often in large companies where the developers who founded the company have moved into leadership roles yet still make technology decisions using ancient criteria (I refer to this as the Frozen Caveman Antipattern). Thanks to Martin Fowler, Jeff Norris, Kief Morris, Rouan Wilsenach, and Stuart Rolland for useful feedback on early drafts.